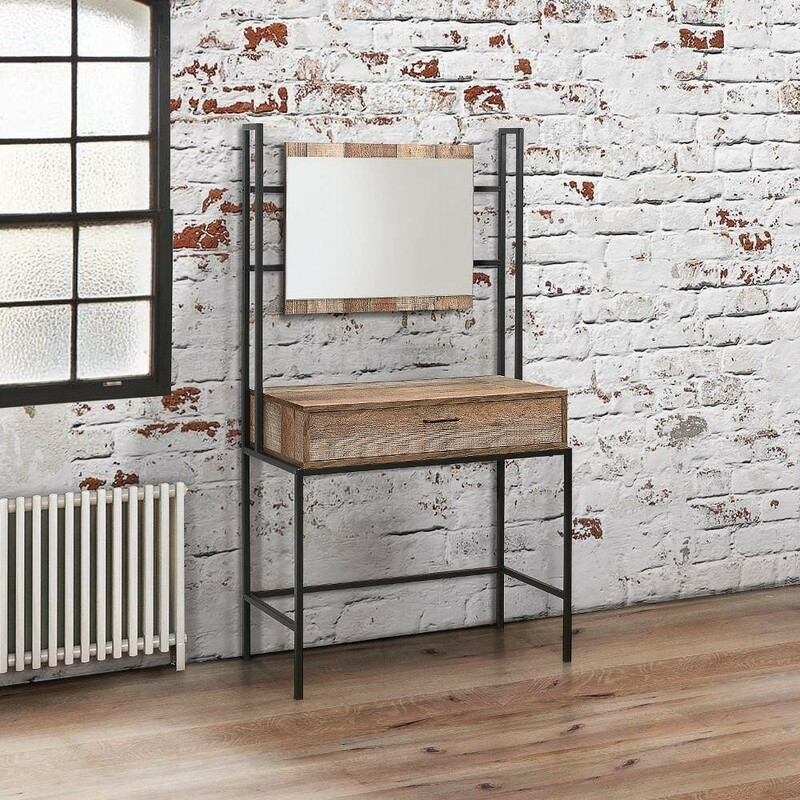 Introduce industrial chic interior design to your home with the Urban Dressing Table and Mirror. The Urban Dressing Table and Mirror has a rustic finish, achieved with the use of wood-effect on the dressing table, drawer space and mirrored surround. The mirror is secured onto the dressing table, and the addition of the drawer provides plenty of space for your everyday essentials, makeup and jewellery. Modern dressing tables can be hard to find. The Urban Dressing Table and Mirror is perfect for contemporary homes as the design is inspired by New York living and loft apartments. The wood effect is complimented with the use of the metal frame; providing strong and straight lines that work with the industrial vibe of the furniture. The Urban Dressing Table and Mirror is an excellent statement piece for the modern home. The dressing table includes a drawer that is spacious and perfectly situated to allow for a chair or stool to be stored beneath. The drawer is ideal for storing away make-up and beauty products. The Urban Dressing Table and Mirror is a stunning piece of furniture that works perfectly in the bedroom. However, it's industrial styling and practical design means it would work beautifully as a simple statement piece or a practical piece of furniture in the hallway too. Increase the amount of practical furniture you own with the Urban Dressing Table and Mirror. This piece of furniture is part of the Urban Collection. Mix and match your favourite industrial inspired furniture to create interesting focal points. Each piece is practical and stylish, the perfect combination for modern interiors and living standards. The Urban Dressing Table and Mirror can be kept clean by using a soft cloth to remove any dust and dirt. The product is part of the Urban Wooden Bedroom Furniture Collection.